They are practically nil, but over the years, this one memory has become more and more important, even before Joey became the son of my heart, before I met him – because of my own changing beliefs and disenchantment with Christianity. When I was in high school, the annual Christmas Concert was a HUGE EVENT. All the music students got out of other classes to rehearse. There were hymns, favorites, one of the choruses from the Messiah, even wonderful medleys arranged by one of the teachers. It was held in the evening, filling two gymnasiums, with the freshman choruses in the balconies on either side, musicians in front, and parents and guests facing them. The only problem was, in that high school, half the students were Jewish, meaning half the audience probably was, too. 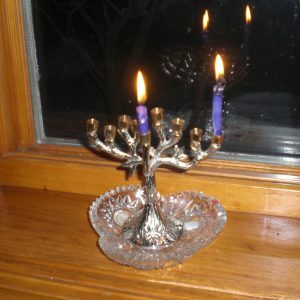 I began reading about Hanukkah and looking a bit for the prayers I knew went along with candle-lighting. I had to watch several videos to understand what a writer meant by “load candles from the right, light them from the left.” It became clear when I realized it didn’t really mean anything on the first night of the 8-day celebration, because there would be only the Shamash (the 9th candle, the one used for lighting the others) and one candle clear at the right. I was ill through October and November, with 30 doctors’ appointments in 44 business days, but I managed to find candles I liked at Amazon that said they were exactly the right diameter for my menorah. Yes, I measured. I didn’t get much else done. Just a couple of years ago I would have started earlier and learned the prayers set to music so I could sing them. But Reinke’s edema of the vocal folds put an end to that. I can no longer sing sustained notes or on key. So I printed out the prayers and found a YouTube video of a Cantor singing them that I liked. Everything was set. I wasn’t sure if, as a woman, I needed to cover my head, but I decided I would, and went looking for my favorite head scarf. And I couldn’t find it. I found every other scarf, including some I didn’t even know I had, but not the one I wanted. So I wound up tying on a scarf that turned out to be too small. Oh well, I told myself. Everything doesn’t have to be perfect. First – the candles didn’t fit. They were too small. So I went to grab the matches and drip some wax into the sconces. Only – no matches. I remembered exactly where my daughter had placed them three weeks ago when she visited. I remembered that I didn’t like that place and exactly where I put them instead. They weren’t there. And since I quit smoking 8 months ago – no lighters, either. I tried heating the bottom of a candle at the stove, but by the time I carried it back to the menorah, it was too cool to stick. I tried lighting a piece of spaghetti and carrying it to the menorah, but it wouldn’t stay lit long enough. I finally got SOME wax into the sconce and tried to force the candle into it – and the candle broke. I was so glad I’d told myself it didn’t have to be perfect! It meant I could chuckle at the whole thing. Finally I found a candle where the wick stuck out the bottom. Against all the rules, I took the menorah over to the stove and managed to get candle #1 in place. 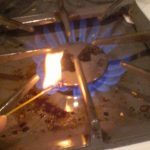 Then I lit the Shamash from the stove. I realized it was going to drip on my hand while I held it, though, so I picked some plastic packing material out of a bag of recycling and pinched the bottom of the candle in it. I went over to stand in front of the TV where I had cued up the YouTube video. Looked around. Sat down. Felt around in the throws. No remote. Got up. Found it back over by the box of candles. As I said, I’ve been ill. By that time I was just too tired to stand any more, so I held the candle in one hand (the wrong hand, I now realize) and my printout of the prayers or blessings in the other, and while the video sang, I murmured the words softly. As prescribed, I went back to the menorah and lit the first candle. Then – oh, joy! 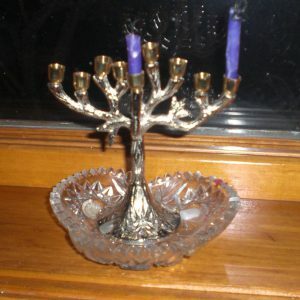 – I had to get the Shamash candle to stay in its sconce, which is slightly set back from all the others, in the center. It didn’t want to cooperate either. More dripping wax into the sconce, from the top this time. At last, at last, it went into place and stuck there without breaking. My first menorah was finally lit! The rules say the candles should stay lit and attended for at least 30 minutes. So I did some cooking in the kitchen. Five minutes before the half hour was up, the first Chanukah candle went out. The rule is, relight it from the Shamash candle. Only I didn’t dare remove that candle, so I lit the piece of spaghetti from it and then re-lit the first-night candle. By the time the same candle went out again, the half-hour had passed and I was utterly exhausted. My low back was screaming in pain, my mid-back was moaning, my strength to stand was gone. I couldn’t continue cooking. I put a lid on the skillet of ground beef and came upstairs to my office to type this whole story out. That was probably not the most healthy thing I could have done for my body, but it has been good for my soul. Notes: (1) I found multiple spellings for some of the transliterated Hebrew words (notably Shamash) and even more variations in what should or should not be capitalized. (2) I’ve used both Hanukkah and Chanukah because (a) “Hanukkah” is more recognizable, and (b) my son says “Chanukah” and I try to pronounce it the same way. (3) The video I used tonight is Hanukkah Blessings with Cantor Joel Lichterman. (4) If anyone has ideas for making the candles stick into my menorah (I’ve tried the tricks I already knew, and they’ve always worked before), please post them in the comments! (5) Only at this moment, just before posting, have I remembered that I am going to have to fight with the candles for 7 more nights – and one more candle each night. I’m laughing!